Diary of an Aspiring Loser: The 7-Minute Workout...It's Science! I'm five days out from surgery and things are looking up. I'll spare you all the gory details. For now. I'm working on my tell-all post and will include all of them there. Just know I've been suffering. But less so today. And I'm already dreaming about my post-recovery comeback. 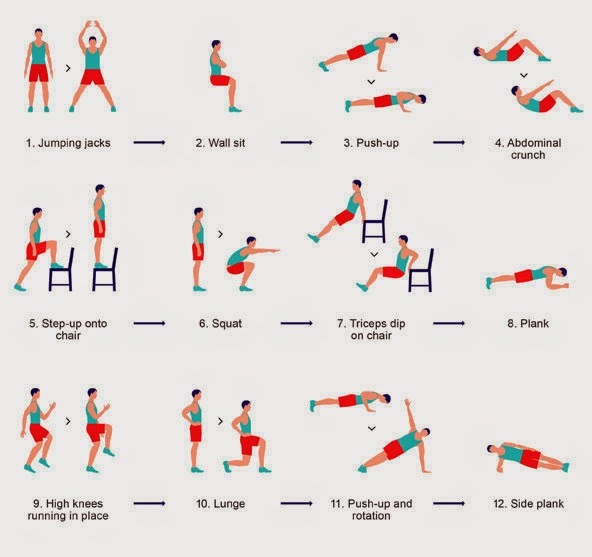 I found this article on The New York Times Well Blog, The Scientific 7-Minute Workout. First of all, seven minutes. And further, no equipment required. Well, except a chair. That means you can do it at home. Or in a hotel room while on the road. Or heck, even at your office. There's a catch though. It should be unpleasant. "The exercises should be performed in rapid succession, allowing 30 seconds for each, while, throughout, the intensity hovers at about an 8 on a discomfort scale of 1 to 10, Mr. Jordan says. Those seven minutes should be, in a word, unpleasant." And by unpleasant, I think they mean suffering. Anyway, here's what I'm lusting after these days. "In 12 exercises deploying only body weight, a chair and a wall, it fulfills the latest mandates for high-intensity effort, which essentially combines a long run and a visit to the weight room into about seven minutes of steady discomfort — all of it based on science....even a few minutes of training at an intensity approaching your maximum capacity produces molecular changes within muscles comparable to those of several hours of running or bike riding." I don't think they're proposing that 7-minutes can replace endurance exercise like running or cycling but I know, at the very least, they are saying that you can get more out of something like a 7-minute workout than was previously thought. And at the very, very minimum, something is always better than nothing. Anyone care to try it out? In case you didn't read the article here's how it works. Do each exercise for 30 seconds at a high intensity, 8 on a scale of 1-10. Rest for 10 seconds in between. That's it! I'm looking for someone to do it and write up a review that I can post on my blog. I'm interested in how easy/difficult you thought it was, how you'd compare it to a longer workout that involved running or cycling and, if you wear a heart-rate monitor, how many calories you burned. If more than one person does it, even better! I'll edit them so don't worry about grammar. Here's a YouTuber who demonstrates. And she gives alternatives in case the exercise is too difficult, which I like. Anway, email your report to me at funez.michelle at gmail.com. I hope someone does it! That looks like a good quickie workout!!!! I'm going to try it (and yes I'll write a review for you!). It reminds me of Sentao an exercise class put out there by Zumba! It was a killer!!! !